A private law enforcement agent (PLEA) is once again requesting a freeze on the accounts of the Bulgarian First Investment Bank (FIB or Fibank) once the lender lost its case in the Supreme Court of Cassations (SCC). Per the Court’s final rule, FIB must transfer to the Romanian Ministry of Agriculture a EUR 22 million bank guarantee that it owes as collateral in a deal with food deliveries for Romania’s poor people. The deal is notoriously known as the biggest one-time theft of European Union (EU) funds, conducted with the complicity of the Bank. On January 28, 2019, the SCC issued its decision 340, rejecting FIB’s claims against an enforcement action by the Ministry of Agriculture of Romania, confirmed by the Sofia Court of Appeals in 2016. The previous freeze of FIB’s accounts took place at the end of 2016, but the Bank managed to stop the enforcement by appealing with the SCC. Now, FIB’s last chance is to overturn the very cause for the case in the Bucharest court, where the hearing is scheduled for Monday, February 11. However, the chance that the guarantee will be dropped is not that big, according to the case’s documents, which Bivol has examined. Our site has been following for years this scandal which OLAF and the Romanian Anti-Corruption Prosecution Office are also investigating. “Judicial proceedings progress in accordance with the established procedural order and information on their development is available only to the parties in the specific case. The BNB implements court decisions in so far as they pertain to it. The office of private enforcement agent Ulyana Dimolarova did not respond to the request for comment on the stage of the enforcement proceedings in case 20168580401364, which had been resumed on January 31, 2019. The Romanian side’s lawyer, Milcho Bengarski, did not answer his phone. Everything started in 2012, when the Bulgarian company “VM Corporation” won a public tender for the supply of flour and cooking oil for the poor in Romania. To win the tender, the company provided bank guarantees from FIB for a total of EUR 33 million. The Romanian Agency for Payments and Intervention in Agriculture (APIA) transferred the money to VM Corporation, which did not deliver any flour and/or oil, and then FIB refused to pay. The money disappeared in offshore accounts, and ever since then APIA and FIB have been leading court battles for the guarantees. It seems now that the saga has reached its final stretch. The SCC ruled that the claim against FIB is valid and the rule is final. Beyond the court battles, however, there is a twisted criminal story that is also evidence of a serious deficit in the system for protecting European funds from theft. OLAF and the Romanian National Anticorruption Prosecution Office (DNA), now the National Anticorruption Directorate, are the bodies engaged in the unraveling of the affair. Their investigation established that the masterminds of the scheme include Bulgarian nationals Ivan “The Universal” Tanev and Mila “The Bloody Mila” Georgieva from “The Killers” gang along with several other helpers. However, the indictment explicitly states that the scheme has been implemented with FIB’s complicity. A destitute individual with a bank guarantee for EUR 33 million On paper, the owner of the company is the impoverished Bulgarian citizen Valeri Miloradov Petrov. Bivol was able to find him and he told us in a camera-recorded interview how he has worked as a professional “strawman” for different companies. Regarding VM Corporation specifically, he said that the Bank had kept his company seal and that he had visited FIB’s headquarters to sign documents. Bivol and Rise Romania also managed to get in touch with Ivan Tanev. In a lengthy videoconference interview, he categorically denied any involvement in the scheme and blamed FIB and Mila Georgieva’s gang for the theft. Where is the money? With “The Killers”! OLAF and the DNA have established that money has been stolen through accounts in Cyprus in the Bank of Cyprus and two offshores on the Seychelles and the British Virgin Islands. The tracks led to companies in Hong Kong, where, however, the investigators hit a wall. However, Bivol’s investigation went further and traced part of the money back to Bulgaria, where it has been used to buy a pellet factory and real estate. This became possible after we managed to convince Valeri Miloradov to cooperate. He gave a power of attorney to our reporter Dimitar Stoyanov, who traveled to Cyprus. At the Bank of Cyprus, he learned that the accounts of VM Corporation had been closed by lawyer Orestis Shambartas. The same lawyer also emerged as the owner of one of Hong Kong’s companies – Sun Power Industrial, to which part of APIA’s money has been wired. But for whom did Shambartas work? He refused to disclose his client before Bivol but said that all his actions had been completely legal and he would provide information only to law enforcement. 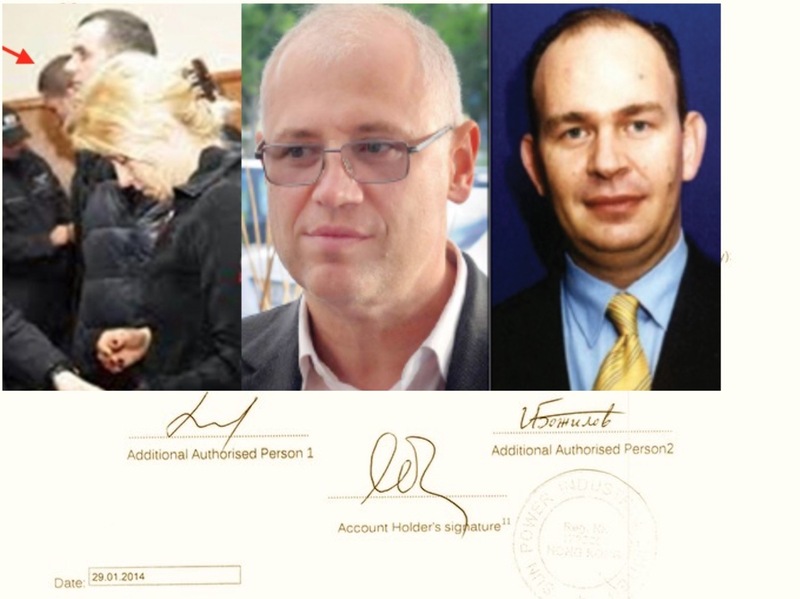 Subsequently, a joint investigation by Bivol, Rise Romania and the Hungarian center for investigative journalism Atlastzo revealed that Sun Power Industrial had an offshore bank account in the St. Vincent and Grenadine Islands. The leak, known as The Panama Papers, brought to light the owner of that bank – Hungarian entrepreneur Otto Hujber, who has a reputation of a “businessman” associated with the Hungarian Socialist Party in the early years of the transition period. The money from Sun Power Industrial‘s offshore account has been used by the Bulgarian thugs from “The Killers” gang – Georgi “The Tennis” Bozhilov and Ivaylo “The Tennis” Bozhilov and Mila Georgieva. This is evidenced by credit cards applications on their behalf, signed by Mila Georgieva. Bank statements, which Bivol possesses, show that hundreds of thousands of euros have been transferred through another company in Cyprus to the Bulgarian company MiM Corporation, controlled by Bozhilovi and relatives of Mila Georgieva. The company has bought with this money a pellet factory and expensive real estate. But most of the APIA’s millions have sunk into another offshore company – Grand Ocean Services. It is represented by Ivan Karatsanov, to whom FIB has issued a bank reference letter #11-7017. As Bivol wrote, Romanian investigators have already requested documents in connection with this letter, which usually serves to open a bank account abroad. Meanwhile, Karatsanov is also a proxy of VM Corporation – the company of the destitute Valeri Miloradov Petrov that robbed the Romanian poor. Thus the circle closes. It turns out that the Bank knew very well who controls Grand Ocean Services and how it is related to VM Corporation. In addition, the property relationship between Mila Georgieva and one of the owners of FIB, Ivaylo Mutafchiev, about which Bivol wrote in 2015, is also a fact. The shedding of light on the affair with the millions stolen from the APIA provoked a sharp reaction. Bivol’s reporter Dimitar Stoyanov, who videotaped Valeri Petrov’s confession, was tailed by thugs. Then the mercenaries of Channel 3 TV of controversial lawmaker and media magnate Delyan Peevski travelled all the way to Paris to harass Bivol’s editor-in-chief Atanas Tchobanov. There was a remarkable statement by one of the directors of Channel 3 TV as she explained in an interview for bTV that they had been investigating Bivol’s journalists because Bivol’s journalists had been investigating individuals associated with the APIA affair. Thus, Peevski’s mercenaries – Channel 3 TV – a major borrower from FIB and a guarantor of the impunity of its majority shareholders, Tseko Minev and Ivaylo Mutafchiev, practically admitted that they had been activated precisely because of this particular investigation by Bivol. It seems that after seven years of lawsuits and a complicated cross-border criminal investigation, things are finally moving towards a conclusion. The Romanians are on the verge of their first significant success – the recovery of the money from the guarantee. In addition, APIA bosses, who had signed under the payments to the phantom Bulgarian company were arrested and indicted in Bucharest. No one has been charged in Bulgaria so far, and the Bulgarian Prosecutor’s Office has not undertaken any activity in connection with the affair. The case, however, revealed to what extent EU and Bulgarian anti-fraud and anti-organized crime authorities are powerless and “fictional heroes”, as Valeri Miloradov calls them. It sounds incredible, but it is a fact – in the 21st century, tens of millions of euros from the European budget can disappear without a trace. For seven years, European and national institutions have been unable to trace the stolen millions, despite their huge operational capacity. Even the Romanian DNA has failed to get as far on the money trail as the investigative journalists of Bivol, Rise Romania and Atlastzo did. There is the separate issue of whether there is any political will for the investigation to be conducted in such a way as to reveal the whole truth and end with convictions of all those involved.